The Jungle Book (2016) Rated PG | What to Watch. 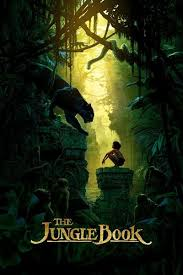 A boy raised by wolves is threatened by the tiger, Shere Khan, and now he must decide whether he will live with humans or remain in the jungle. Starring Neel Sethi, Bill Murray, Ben Kingsley, Idris Elba, Lupita Nyong’o, Scarlett Johansson, Giancarlo Esposito, Christopher Walken, Garry Shandling. Jon Favreau did an amazing job of making this live action film from the animation film. The CGI animals were fun to watch even though it is quite obvious they are CGI. However, CGI has come along way since it’s start. The famous voices behind the animals were definitely distinguishable. Still, I couldn’t get over the animals talking like humans or Mowgli wearing a loincloth. Neither of these made any sense since its live action. Sethi, the young actor who plays Mowgli, did a fine job in his role, but apart from being cute, I didn’t feel any special connection to his character. This film is worth a watch, but I still prefer the animated version. This entry was posted in 2016, Adventure, Disney, Drama, family, fantasy, films, Movie reviews, movies, Rated PG, reviews and tagged actor, animals, animation, animation version, ben kingsley, best, Bill Murray, books, boy, CGI, Christopher Walken, famous, film, film reviews, films, Garry Shandling, Giancarlo Esposito, human, humans, Idris Elba, job, jon favreau, jungle, kid, live, live action, loincloth, lupita nyong'o, movie, movie reviews, movies, Neel Sethi, Scarlett Johansson, The Jungle Book, tiger, trailer, voice, wolves, world, worth, young. Bookmark the permalink. Pingback: Critics Choice Award Nominees 2016 | What to Watch. Pingback: Critics Choice Award Winners 2016 | What to Watch. Pingback: 25th Annual Movieguide Award Nominees 2017 | What to Watch. Pingback: Academy Awards Nominees 2017 | What to Watch. Pingback: The BAFTA Awards Winners 2017 | What to Watch. Pingback: Academy Award Winners 2017 | What to Watch. Pingback: Films I’m Looking Forward to 2016 | What to Watch. Pingback: New This Week in Theaters, April 14, 2016 | What to Watch. Pingback: New This Week on DVD, August 30, 2016 | What to Watch.